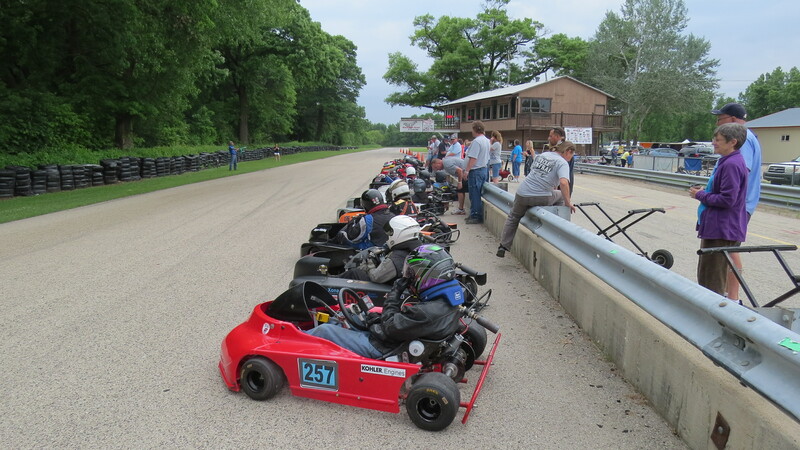 I really can’t express how much we love to race at Blackhawk Farms Raceway. It’s 7 turn 1.9 mile track is nestled 216 wooded acres and is as fun to drive(according to Jason) as it is beautiful. This weekend we also brought some family to the track with us. My Aunt her partner and my Mom. Having folks in the pits with us makes it just that much more fun. Not only do you have someone to talk to during the race sometime lunch suddenly appears when you need it most. Thanks Mom. Jason was very fast in the sprint kart, but has few to race with. On both days he ran about as fast as that kart would go, with 1:29 second laps, a mere 2 seconds slower then the fastest animal road karts. On Sunday there were a couple of other drivers in his class but he left the grid and was gone. Both races he handily took the race and class win gaping the field by nearly 30 seconds. Saturday’s practice in the road kart started off pretty well. We were starting to get it dialed in when a side cover gasket let go on the motor. 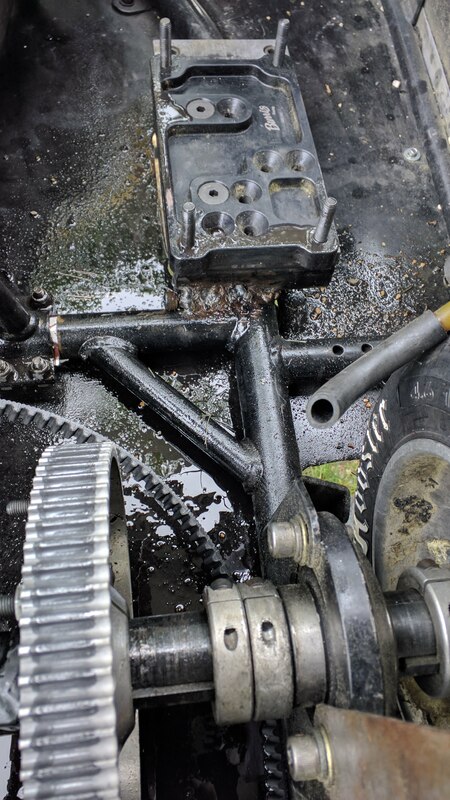 Thankfully, the worst that happened was some oil was sprayed around the kart, to 4 Cycle Central it goes for minor repairs. I grabbed the spare engine and had it back together just in time for the next round of practice. The spare motor has a bit more horse power and I was saving it for Mid-Ohio. 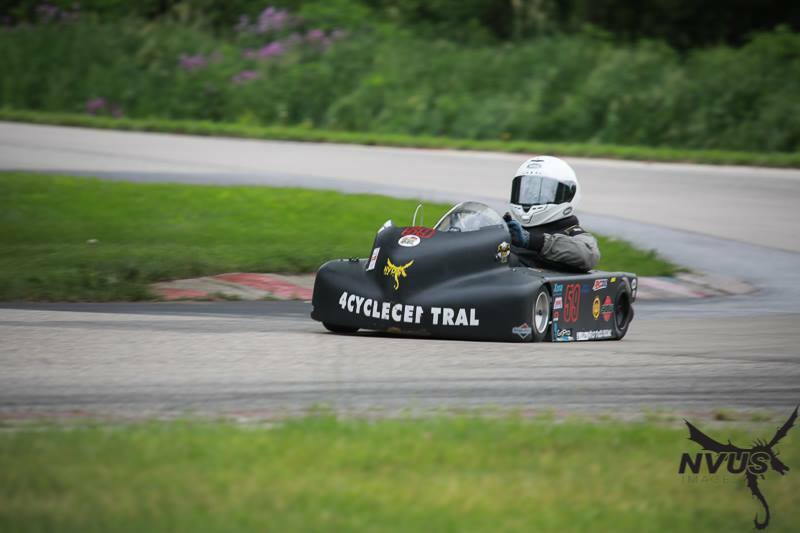 With one round of practice left before racing we were still tinkering to get the handling right. It was a bear to drive and Jason had to keep it finessing the wheel to keep it on track and was losing about a second to the much of the field. After wresting setup all Saturday and most of Sunday to improve handling, we finally noticed that the tires had been used up and that was the cause of most of the issues. Of course, this was just before Sundays second race. Jason found a set of mounted tires we borrow. The only issue was they wheels where wider in the rear which again changed setup, it was all just a guess. This of course resulted in the last race being tough and Jason came off physically and mentally sore from struggling with the kart. As we packed up the karts he noticed one of the borrowed tires had gone flat as some point during the race and the some the floor panel bolts had ground off. He can really drive a bad kart fast, yikes! He started Saturdays race in 20th and finished in 7th and 12th, Sunday he started in 19th and finished 10th and 12th. Really, not a bad weekends result. The next race will be Mid-Ohio Sports Car Course. This track supports both Indy and NASCAR races. It is loaded with rolling hills and technical turns were you need to plan for the next 3 corners. We hope to repeat last years results but expect to learn something no matter what happens. That weekend is also the Dart Kart Club banquet where Jason will receive his 2017 Championship accolades.